Grafham Water SC welcomed the RS Feva class for the first Bolle sponsored Grand Prix event & 4th qualifier for the 2012 World Championships. 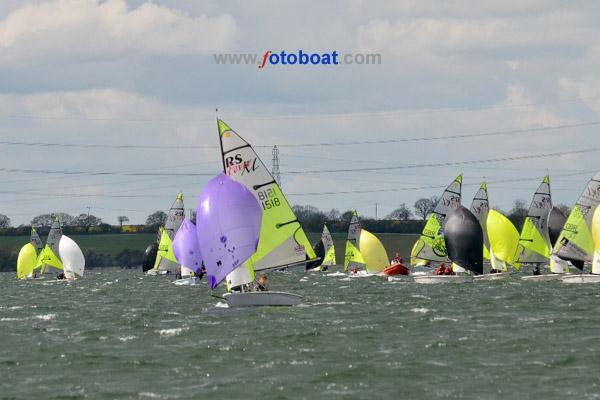 90 RS Fevas joined Flying 15s, Scorpions & Larks for the multi-class event set on two courses. On Saturday the boats made it to the start line with thick black storm clouds looming. Race Officer Peter Saxton & team gave the fleet time to arrive & settle with a 5 minute AP & after a general recall & black flag start the fleet got away. With the wind tending to pull right to the clouds & 6 – 10 knots of breeze it was Lauren Miles & Esther Fenton-Jones who battled with Tom Darling & Will Dolin (caught black flag ) all the way round. Arran Holman & new crew Josh Haynes were hot on their heels to take 2 points whilst Chay & Stirling Taylor climbed through to gain the 3 points at the finish. A big wind shift caused the AP flag to be hoisted 3O seconds before the 2 nd start but the race got away with 3 boats black flagged. James Hutton-Penman & Thomas Jayasekara led convincingly from start to finish in the gusty testing conditions. The battle continued behind with Elliott Wells & Jake Todd climbing through the fleet to finish 2nd whilst Flynn Davies & Daniel Lewis pulled through from 5th to 3rd. By late afternoon the clouds built further & a short postponement was signaled allowing a 25 knot squall & huge right shift to pass by. At the fourth attempt & after 16 boats were caught black flag the fleet got away in a sublime 5 knots ! At the windward mark it was Arran & Josh leading from Will Robinson & Joe Hills in 2nd with Jenny Smallwood & Jamie Webb in 3rd. The fleet coasted down the run in 3 knots of breeze with a huge black cloud heading straight for the middle of the course. As the leaders Arran & Josh followed by Will & Joe then Tom & Will arrived at the leeward gate the Race Officer made the decision to abandon the race before things got silly. The boats were close to shore as lashing rain & 30 knot gusts from every direction ripped through the fleet. The wind had now increased slightly & moved left. A clean start saw James & Thomas flying again but it was Jess & Hattie on form who took the win with James & Thomas 2nd & Jenny & Jamie 3rd. With the wind still building to 15 knots the boats started to ‘heat up’ downwind resulting in lots of place changes as the boats fought for the fastest angles downwind. Race 5 saw Will & Joe overtaken by James Curtis & Harry Phelps. Arran & Josh in 3rd then struggled with a broken kicker. At the finish it was James & Thomas in 3rd. The final race was going to be quite a show down with anyone of 10 boats able to win the event. 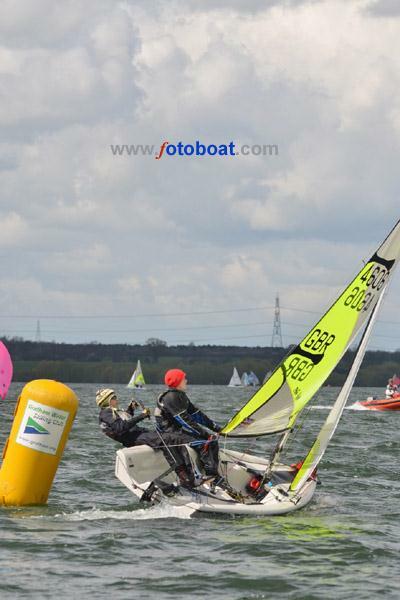 The wind increased with gusts of 19 knots resulting in one of the leaders capsizing on a gybe to the gate . James & Harry were leading again but were overtaken by Elliott & Jake who took the win when the race was shortened whilst Jamie Jobson & Eve Gadd stormed through the fleet to take 3rd. With different winners & such a depth of fleet it was too close to call who had won the event but when results were published it was Jenny Smallwood & Jamie Webb who had clinched victory by the narrowest of margins. 3 points separated the top 6 boats. A huge thank you to GWSC for running such a great event & Bollé Marine for their sponsorship in the form of Bolle’ sunglasses as prizes.